In a pan over simmering water, melt together cream cheese, butter, and milk. If you opt to use vanilla beans, scrape the beans from the vanilla pod and add it to the pan. Once melted, cool to room temp. Using a mixer, add in flour, cornstarch, salt. Then add in egg yolks and lastly the lemon juice. Set aside. In a separate bowl, mix egg whites and cream of tartar until foamy (or frothy). Add in vanilla then gradually add sugar until stiff peaks form. Fold in the egg whites to the cream cheese mixture. Make sure everything is well combined. Pour batter into an 8-inch round cake pan covered with parchment paper. Bake the cake in a water bath for 1 hour and 10 minutes or until done at 325F. To make the icing, open two cans of condensed milk and pour it over a pan. Add in egg yolks and cook over low heat. Add in vanilla and almond extract. Cook until it thickens enough to spread. Add in butter. 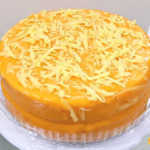 To assemble the Yema Cake, divide the cake into two. Add the filling then cover it with the other half of the cake. Cover the rest of the cake with icing. This video shows another recipe for yema cake.